The shape of the earrings is based on the Tuareg tappet with which the Tuareg crush the millet. These handmade earrings convince by their simple but very elegant design. 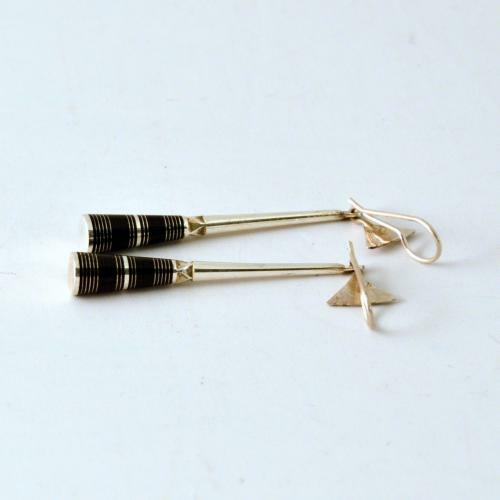 The earrings consist of a silver body (98% silver) with small ebony inlays. This design creates beautiful contrasts on the earrings. These outstanding earrings are a great present for a good friend. The designs and stories of this ear jewellery are passed on by the Tuareg from generation to generation. Thus, the art of silversmithing is a kind of storytelling. The horizontal lines on the ear studs represent a Tuareg caravan route. The shape above the ebony of the earrings, called Azmam, is in the form of pearls on a Tuareg necklace. The silver of these earrings is 98% pure. We purchase the earrings directly from the Tuareg artisans and can thus guarantee that the production and trade conditions are fair. No money is lost to middlemen. As much of the profit as possible will remain with the silversmiths of the Ataher family in Agadez.